My partner and I will be in Noumea soon on a cruise (we have a full day stopover), although there are some tour options available through the cruise line we would like to go with a local provider. Are there any local tour operators at the cruise terminal? Otherwise we were thinking about offering a taxi driver some money to take us around the city. Would love to hear whether anyone has done either/ how easy it is? Related: What are the most popular tours in Noumea? Hi Sarah generally the smaller cruise ships dock at the cruise ship terminal if your ship however docks in the commercial port a free shuttle will be provided from the ship to the cruise ship terminal. There will be a number of tour vendors at the terminal offering various local tours. One option for you is to do a trip on the local TCHOU TCHOU train which gives a nice overview of the city. When we visit Noumea we just like to get the HOHO bus and go around to the Bai De Citrons for a swim. If doing you own touring I would just get off the ship as soon as you can and make certain you allow plenty of time to return to the ship. AUD is accepted in the cruise ship terminal but outside that area you need local currency there are ATMs at the Casino supermarket just opposite the cruise terminal. Noumea and the south pacific islands are something we always look forward to visiting to when we do a cruise. Here's a trick never book anything on board any cruise ships, their tours are way overpriced. Anything you pay gets charged on your own cruise card and the money goes back to the corporations instead of the locals. Many corporations have tried to expel some of the local tour operators so that the cruise ships will have all customers for themselves only. Greedy and pointless corporations can't even cater for the entire ship. Words from the local tour operators who have claimed that many of them have been approached by corporations themselves to buy their buses and trains and replace local drivers and guides with cheap foreign workers. Which ones are the local tour operators and the ones that work for the cruise ship? There are many local tour operators at the Cruise ship terminal: Wamy Tour, Dal Ocean, Nouméa Beach Car, Fernando, Magic Bus, Noumea 2D with 2 stunning Double Deckers and the Lyvai Company with their Green trains and Hop-On Hop-On Buses...... When you book directly on shore or with companies' websites it's even cheaper. On the other hand The TCHOU TCHOU train is owned by Nouméa Discovery / MARY D who operate the Yellow wiki and Bumblebee Trains and work for the cruise ship. They have buses with the name Mary D on it, their team wears a yellow shirt which is written Shore Tours. You will recognize them when they start selling their tours on board the ship itself. Yellow Shirts = Cruise Ship all the other ones are local tour operators. So Sarah J, the choice is yours, you can help New Caledonia by booking with local tour operators. Welcome soon in noumea, you have lot of activities with local company at the cruise ship terminal and much cheaper than onbord. The New Caledonia Cruise Ship Tours is a conglomerate comprising 5 local companies, each of which has been doing business here since the first day that the cruise ships started arriving to the island. Each of these companies – Lyvai Tour, Eden Tours, Country Tours, Philo Tours, Beach Bus - offer a wide range of day trip packages and excursions for tourists during each stopover from the cruise ships. We have a depth of experience in the tourist industry of our island, especially in the field of cruise ships. Our fleet has a wide range of buses, little trains, private cars and a new double Decker bus to cater to customers from all cruise ships. Our prices are affordable and very competitive, and our packages are exclusively tailored to visitors from the cruise ships. Our staff are all professional guides and fluent in several foreign languages. The Green train ride is a 90 minute enjoyable and informative guided tour that offers an opportunity to see Nouméa city and get a sense of it's history. The tour stops at two destinations - the Chateau Hagen, one of Noumea's oldest mansion and part of town's colonial heritage and the Ouen Toro lookout which has a stunning view over the Pacific Ocean and the Lagoon. Customers who booked the Combo package will have the Hop-On Hop-Off shuttle ride included. A 2 and a half hour comprehensive coach tour around Noumea's hinterland with 3 destinations. The Tjibaou Cultural Center, and the church of the Immaculate Conception and finally the Ouen Toro lookout. Customers who booked the Combo package will have the Hop-On Hop-Off shuttle ride included. The Hop-On Hop-Off bus offers a service that runs all day, every 20 minutes and makes it easy for passengers to check out 6 several locations around Nouméa at their own pace. Those destinations include Noumea's morning market, Port-Plaisance shopping mall, Lemon beach, Anse Vata bay, Noumea's Aquarium, The Melanesian Museum. Customers can benefit Discounts on Drinks and Chocolate are available at the 3 Brasseurs local brewery and Tonton Jules little chocolate factory when they alight at Lemon Beach. The Anse Vata stop is opposite the Water taxi terminal that provides taxi boat rides to Duck Island. This small island, located 10 minutes from Anse Vata Bay, is the closest spot for swimming and snorkeling. The package includes the return water taxi ticket as well as the Hop-On Hop-Off bus service asting all day until 4.00 pm. 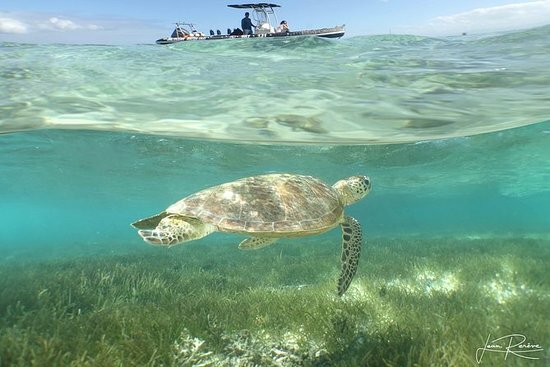 A unique experience where you can find all of New Caledonia's marine life under one roof!Our package includes the entry fee and all-day access to the Aquarium as well as the Hop-On Hop-Off bus service. 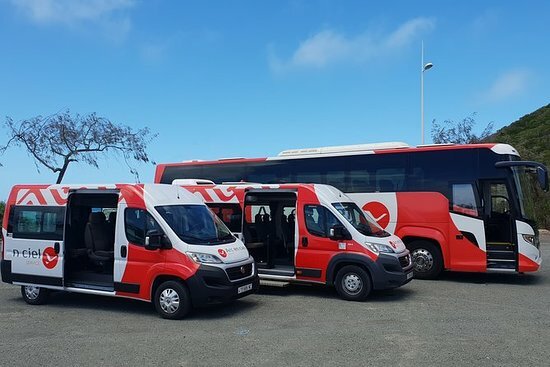 The perfect way for customers to travel in a small group and enjoy a guided tour of Nouméa and it’s surroundings with their choice of destinations on a private mini-bus. A complete guided tour in English with a visit to both the Maritime and World War 2 historical Museums all for the price of one! Our package includes the entry fee and access to both museums with a private mini-bus to pick you up and drop you off again once you finished your visit. Heading south of New Caledonia, travelers will get a real taste of life far away from Noumea's urban landscapes in one of the most spectacular parks on the island - The Blue River Park. Our package includes transportation with a private mini-bus to the park where you can swim at different spots, go trekking and have lunch while watching the beautiful scenery. The Summit Tour offers, gives passengers the opportunity to stop at four of the best lookouts in Nouméa City and enjoy the stunning scenery - The OPT tower hill - The Lorraine Cross at Mount Coffyn - Mount Venus - The Artilleries lookout. This tour starts and ends at the cruise ship terminal and is available to small groups of 8 to 13 passengers. Driving is provided by "Captain Régis" and commentaries by local guide David who will entertain people for 90 minutes ride, packed with historical and fun facts. Tina Golf Course, located on the outskirts of Nouméa, near the Tjibaou Cultural Center, stretches out for 6 kilometers offering golfers a spectacular view of the lagoon and it's surrounding landscapes with the mangrove plantations. Package includes transfer with a mini-van from the Cruise ship terminal to the golf course and all equipment’s are provided. A marvel of architecture among New Caledonia's numerous historical landmarks, the Tjibaou Cultural Center houses many exhibits from traditional and contemporary artists and a collection of rare artifacts from several Melanesian cultures throughout the island. Our package includes the entry fee and access to the Cultural Center all day with a private mini-bus to pick you up and drop you off again once you finished your visit. Passengers can rent a jet ski and cruise around our beautiful lagoon with the help of a skillful guide and qualified instructor and stop at L'Escapade Island Resort. Package includes transfer from the cruise ship terminal. Our package provides transfers from the cruise ship terminal to Tontouta International Airport or Magenta domestic airport. Car rentals are offered when cruise ships are at port, but need to be booked in advanced. Package includes delivery and drop off at Nouméa cruise ship terminal, refueling, vehicle cleaning, full insurance without franchise and optional Infant seat on demand. We were just recently in Noumea staying for 10 days ...we are not cruisers, we fly to destinations then explore. I contacted many of the local guides prior to our trip, only to be disappointed in that they only provide tours for those on cruise ships. Right or wrong the information office in Anse Vata told us we couldn't use the HOHO buses that were running through the town ( there were 3 days of our trip when cruise ships were in port) because you needed to be a cruise passenger. We took our money and did excursions through Mary D because they were happy to serve us. We visited places ourselves but would have loved to have paid for a tour guide. That’s good that you give us the facts about supporting the locals and not the multinational companies. +1 to #3 that info is indeed very useful and one I have saved for future trips to NC. I have tried messaging you regarding a golf booking in December with no reply. Do you still organise golf for cruise passengers? 1) We are wanting to go on the Hop on hop off bus can we pay you by AUD or CFP currency at cruise terminal? 2) For shops and markets is AUD accepted or better to travel with CFP currency? I have found answers to some of the above but they are from a few years ago so just want to check. Thank you for your interest in New Caledonia, which is a beautiful island and have a lot to offers. 1) You’ll find Hop On Hop Off Buses at the Cruise Terminal. You can pay in AUD or CFP currency. 2) AUD is accepted in Organized Tours inside the Cruise Terminal. Then Johnston Supermarket located in front of the Cruise Terminal. Better will be to travel with Pacific Francs ‘cause shops, markets & groceries only accept the local currency. 3) You’ll find a « Money Changer » at the Cruise Terminal and lots of ATM Machine downtown. Usually at banks. Hope you will have a wonderful time in New Caledonia ! We wish to travel from the cruise terminal to Le Meridien Hotel in Noumea. Does the hop on hop off bus go near there, or are taxis or Uber’s available? What is a reasonable price for a return trip? How to reach Noumea from Tontouta (Int'l) airport?